We accept cash or credit. Invoices are available to be paid online. All bookings are required to pay a nonrefundable deposit/retainer in order to be placed on the schedule. Bookings are made by availability. If another party books before the deposit is paid, it could result in Lolo’s having no availability to do your cake. Q. Why do I have to pay a nonrefundable deposit/retainer? A. It helps keep costs low in case of a no-show or cancellation. Cupcakes must be ordered by the dozen per flavor ordered. Prices start at $24 a dozen for standard flavors and just icing. Premium flavors cost extra. For more information on figures and artwork on each cupcake please e-mail or call me for custom prices. A 25% nonrefundable deposit/retainer is required in order to book your order. A “rush order” is required to be paid in full and is 100% nonrefundable. Rush orders are 5 days within event. A rush order fee may be applied. Single tiers start at $60 and go up. 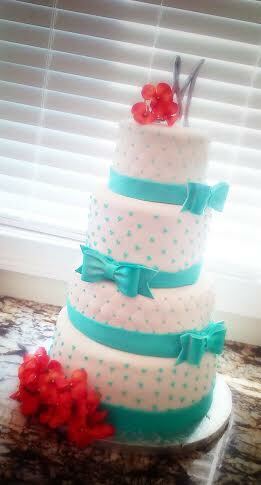 Two tiered cakes start at $125 (6 & 8in round, two layers each) and go up. Flavors, complexity of design, etc. cost extra. Call or email for a quote. We offer a wide variety of shapes and sizes. In order to be placed on the schedule, you must pay a 25% nonrefundable deposit/retainer. This is payable online. Rush orders are 100% nonrefundable and must be paid in full at time of ordering. A rush order fee may be applied. Q. Are special occasion cakes and wedding cakes priced differently? A. Yes. Prices differ because a special occasion cake has two layers per tier. Wedding cakes are 3 layers per tier and are a bit taller than a regular “party cake”, making them more elegant. Some cakes (special occasion or wedding) have what is known as a “double barrel”, which is a super tall tier. Prices are reflected by amount of servings. Tastings are $50 for up to 4 people. You can choose 2 premium flavor options and 1 standard flavor option (marble is not available for tastings). 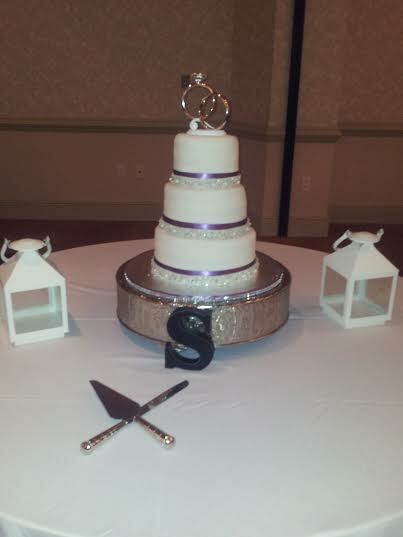 *If you book a wedding cake, $30 of the fee will be waived upon receipt of your 50% nonrefundable deposit/retainer. Deposit must be placed at the time of your tasting in order for the fee to be waived. This is a one time incentive. 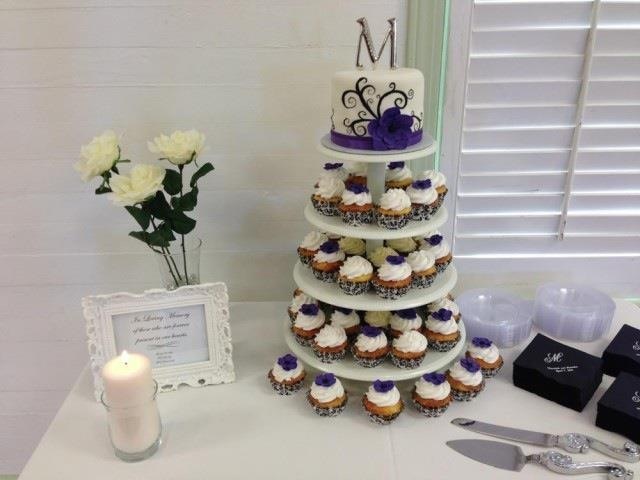 There is a minimum wedding cake price of $200* We offer payment plans to help with the cost of your cake. All wedding cakes must be paid off one month before the event, unless other arrangements have been discussed. A rush order fee may be applied to cakes ordered within 14 days or less of the event. Other sizes available. Quotes available upon request. Serving amounts include the top layer and are calculated for round cakes. Various shapes (square, hexagon, heart, etc.) add $10 per tier. Intricate decorations (Cornelli lace, all-over piping work, multiple fondant cutouts, etc.) will be determined by intricacy. Delivery is $1 per mile (round trip from 106 N Main Street in Crestview, FL with $25 being the minimum delivery fee. Delivery is available for all cakes. It is highly recommended for wedding cakes. Our Delivery Area – if delivery is further than 75 miles, cost per mile will be more. Thank you for having general pricing on your website. Your are the only one I’ve found and it was VERY helpful! Happy New Year! The frosting was gluten-free, but not sugar-free. I have a question…would you make a wedding cake with the traditional first anniversary tier and the rest cup cakes? You called me yesterday to set up appt. I would like to come tomorrow to sit down with you. So please give me a call back tomorrow in the am. ( http://weddings-avenue.com/wp-content/uploads/2010/12/Halloween-wedding-themes-3.jpg ) – My fiance and I like the dripping effect on this cake but the rest of the cake seems a little plain, its missing color and detail. ( http://www.weddingcakesbylisabroughton.co.uk/Halloween%20Wedding%20Cake.htm ) – I love the combination of red and black fondant in this cake, it really makes the cake pop. However I would like to stay away from the butterflies and the nightmare before christmas characters, we are more of a classic zombie couple. I will eventually draw a picture of exactly what I am looking for so that my wedding cake will be origional, but I feel that these two cakes make good examples, so what do you think? Are you up for the challenge? Most definitely! Email me at loloscakesandsweets@gmail.com so we can get this ball rolling! This is going to be fun!!! If I just wanted a two tier cake serving around 20-25 people, how much would that be? All cakes start at $100 minimum.